Enjoy the delicious creamy taste of Hellmann?s Light Mayonnaise, made with absolutely no artificial colours, flavours or preservatives. 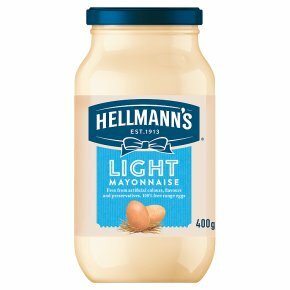 Hellmann?s Light mayonnaise is the ideal condiment for sandwiches, salads and burgers, bringing you a more natural taste to everyday dinners. 60% less calories than Hellmann's Real Mayonnaise. 40 calories per tablespoon for guilt-free taste. Our mayo is suitable for vegetarians. Our mayonnaise is made with free range eggs and sustainably sourced oils, at Hellmann's we're on the side of food and are committed to using only the best ingredients. Over 100 years ago Richard Hellmann created Hellmann's in a deli in New York. He marked his best products by tying a blue ribbon around them. This blue ribbon is still found on the label and signifies our ongoing commitment to great quality products. For a long, long time, we?ve been committed to sustainable farming, responsible business, and doing right by the people who help us make Hellmann?s. Not just because we think it makes our products better, but also because it?s the right thing to do. It?s why we only use 100% free-range eggs and source 100% of our oils responsibly in our mayonnaise. It?s why our ketchup is made with 100% sustainably grown tomatoes. And why we?re always working to create new products that help fight food waste, or use up less energy, or generally do good for the world. Because we?re on the side of food. Hellmann's mayonnaise range include the classic Real, Light and Lighter than Light products available in multiple sized jars and convenient squeezy bottles to add a dollop of inspiration to household of all sizes. We've also launched a range of BBQ sauces including Smokey, Honey and Chilli flavours, to spice up barbecues across the UK. Why not also try our ketchups made with 36% more tomatoes? One is made with the entire tomato crop, both red and green tomatoes, and the other is sweetened only by honey for a more natural offering. Our portfolio also extends to a great tasting American yellow mustard for those hot dog and burger occasions and, of course, the mustard is made only with sustainably sourced mustard seeds.